Blog :: Challenges We Address :: Read Naturally, Inc.
After a challenge is identified, one of two things tends to happen: either the challenge grows, or it shrinks. The challenge tends to grow if the solution is unknown and hard to find. Conversely, it tends to shrink if there is a tried-and-true, high-quality solution at the ready. Renowned dyslexia researchers recommend Read Naturally programs as ideal solutions to help students who struggle with this learning disability. 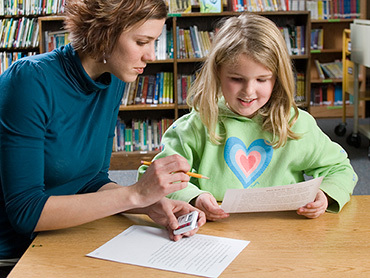 Students with dyslexia typically need intensive, individualized instruction with feedback, guidance, and ongoing assessment in phonemic awareness, phonics, and reading fluency. Instructional programs should emphasize these core elements as well as building vocabulary and increasing comprehension. Read Naturally programs address all of these elements in a systematic, highly motivating way. Click here for more information about how Read Naturally programs can help students with dyslexia. Developing English language skills through the use of the audio built into every lesson. Easy access to the meanings of many words in each story provides ELL students with the word knowledge necessary to understand the story while also building their English vocabulary. Read Naturally stories are nonfiction and provide information on a wide range of topics, which build the general background knowledge of ELL students. Read Naturally offers stories that discuss American manners and customs and define common idioms in the English language. Click here for more information about how Read Naturally programs can help English Language Learners. Research supports differentiated instruction as a best practice in all subjects and shows that it is especially effective in reading instruction. Our interventions were designed by educators with differentiated instruction as a goal. As such, they allow each student to work at an optimal pace for growth. Additionally, Read Naturally offers high-quality professional development that provides educators with the support they need to implement this practice most effectively. Click here for more information on how Read Naturally programs are ideal for differentiating instruction. Research-based interventions at increasing levels of difficulty and intensity. High-quality instructional supports to empower self-directed learning. Systematic documentation of student performance for instructional decision-making. Click here for more information on how Read Naturally assessments and programs work in an RTI model. No core reading program meets the needs of all students in a classroom, so students often need additional support in specific skills in order to meet the standards. Read Naturally programs are well-suited as common core curriculum and are aligned with the expectations for Foundational Reading Skills and many Reading Anchor Standards for English Language Arts (ELA). Click here for more information on how Read Naturally programs align with the Common Core State Standards. At Read Naturally, we are committed to ensuring that the challenges faced by struggling readers shrink instead of grow. Whether you know one struggling reader or several, we would love to partner with you to provide an effective and life-changing solution. Please contact us to discuss your needs or to get started with a free trial.